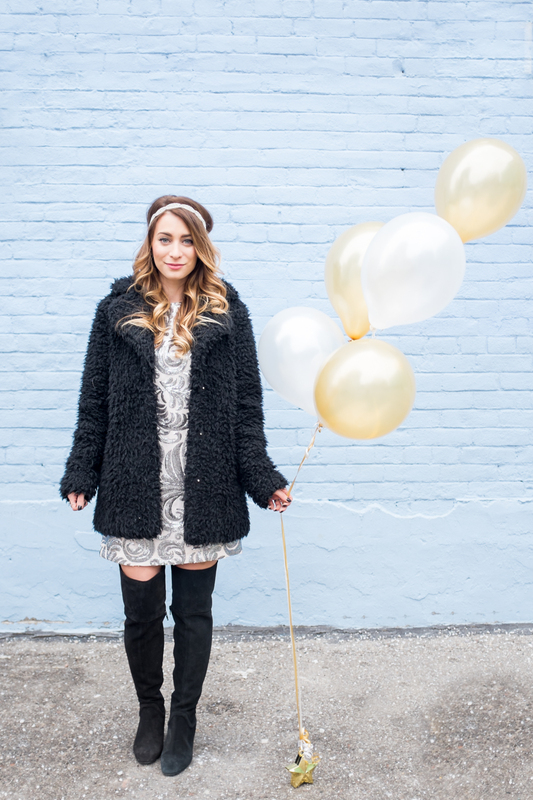 January 2016 | La Petite Noob | A Toronto-Based Fashion and Lifestyle Blog. Isn't it incredible how one piece of clothing can dictate the entire mood of your outfit? This skirt is my last score from the Zara sale and not only has it been working overtime in my closet rotation, but it's given new life to my orange hat. 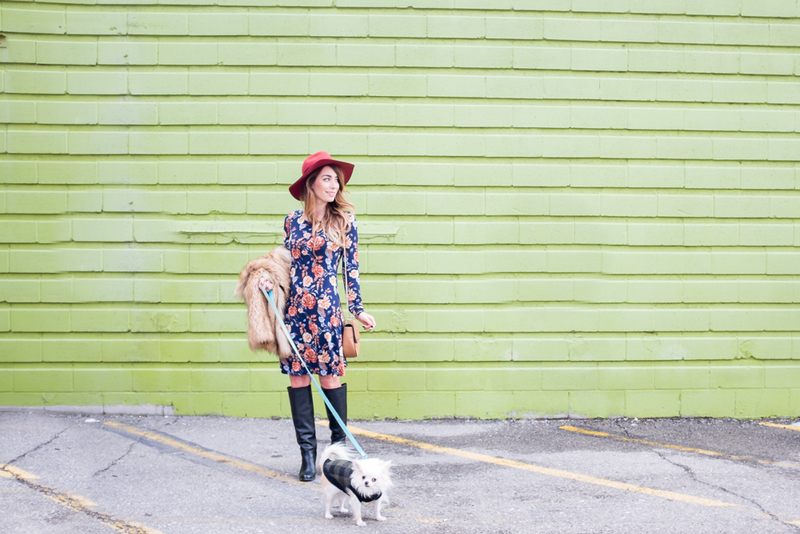 The combination of the bold print, with a jewel toned hat and some knee-high boots gives off a feeling that's a little mod and a little Bruno Mars's Uptown Funk. Either way, I'll take it! Not only do I absolutely love the busy print of this skirt, but I also appreciate the pleated detail in the front - way easier to run around town in! For those of you wondering what a typical work outfit would be for me (one person), this would be it - sans hat of course! What do you guys think? Do you also let one article of clothing dictate the entire feeling of an outfit? 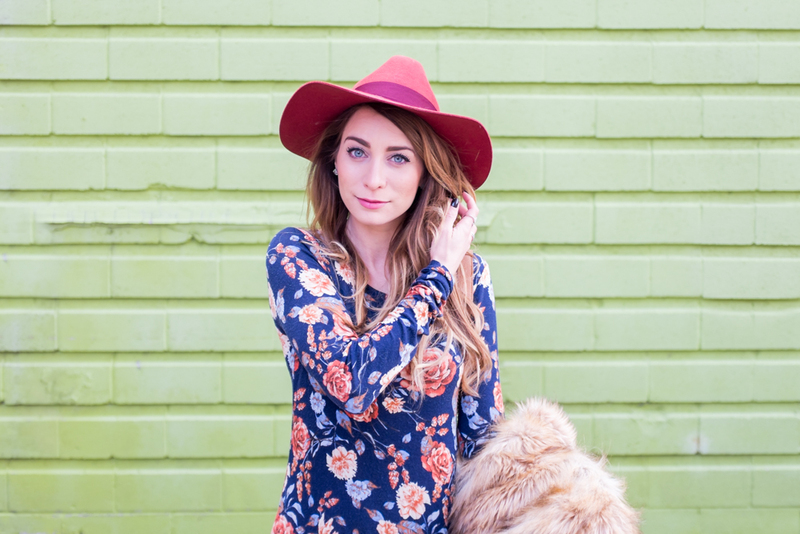 Do you like the jewel tones for winter? Has anyone counted the amount of Fritz hair on my sweater? Anyone? Let me know! Just for the record: I am not cool. Your girl is a Degrassi-loving, clarinet-playing, Vulcan-saluting nerd that sometimes rips herself out of her floral pyjamas long enough to dress like a cool person. This past weekend was no different and with the temperatures dropping to chilling degree, practical was disguised as cool in simple oversized layers. 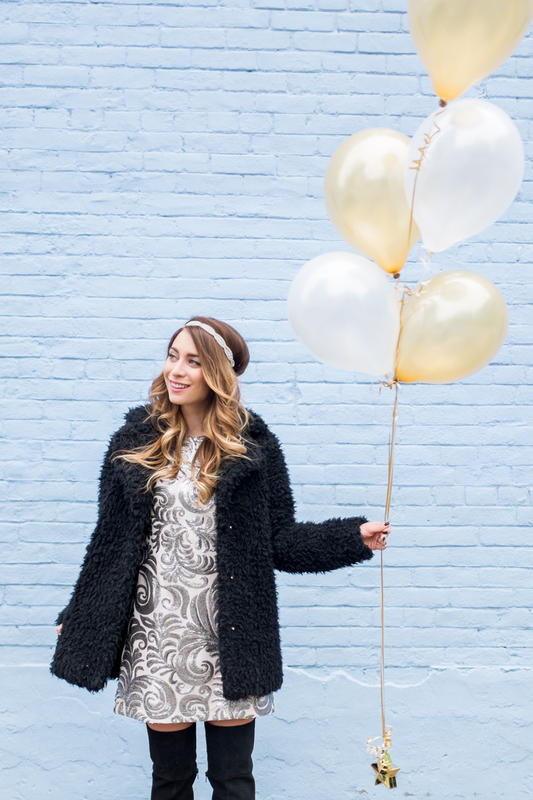 My favourite Aritzia cocoon coat was paired with black denim, comfy trainers and a cozy blanket scarf. 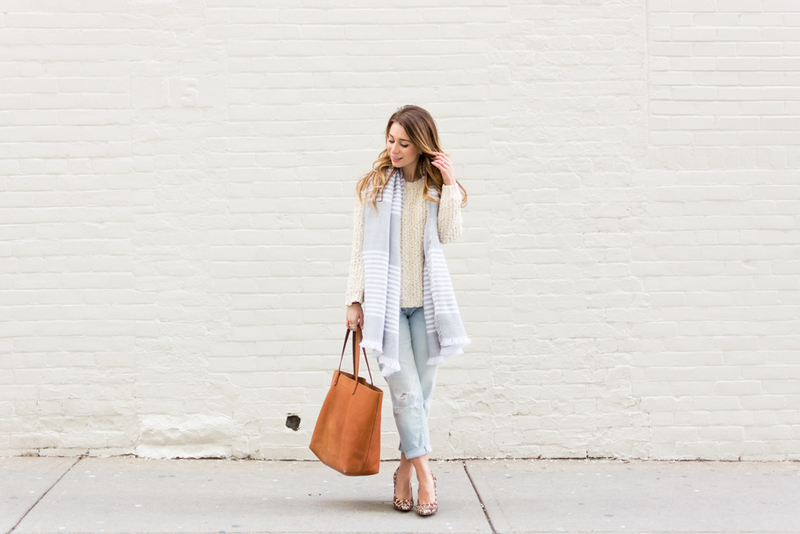 The whole outfit gives off a very simple, minimalist feeling while keeping me warm and toasty in the winter weather. You would never know that just moments before I was indoors in panda-printed pyjamas, Pinteresting ideas on how to style tulle skirts, and watching re-runs of Jeopardy. Incognito cool. 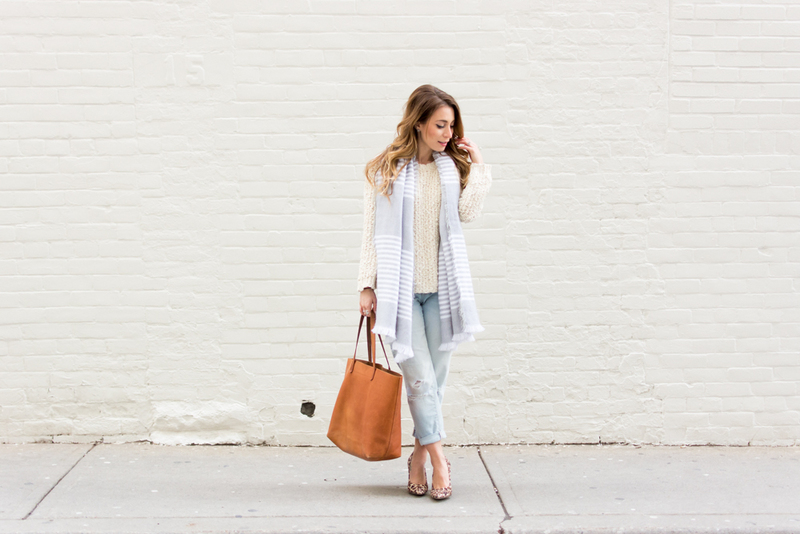 This incredible white grid blanket scarf is a never addition to my winter wardrobe, and I love how it pairs with all of my winter wear. 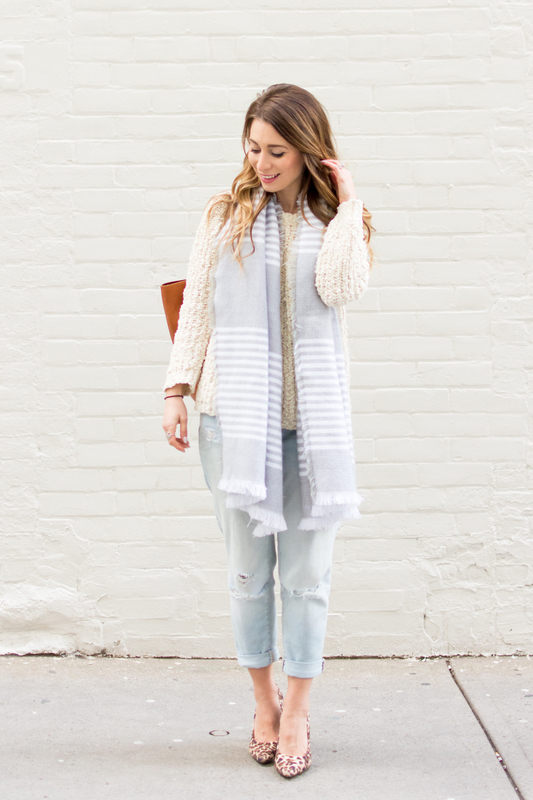 While my collection of plaid blanket scarves seem more appropriate for fall, the white grid pattern gives a very geometric element to winter wear - and is super warm to boot! Although you would normally find me in my favourite black pointy-toe boots (with heels, of course,) the process of breaking in a new pair of shoes had left my feet a painful mess. Swapping trainers for booties not only saved my suffering tootsies, but added a casual feel to the whole outfit that just screams weekend. Trust me, I never thought that I could pull off wearing running shoes in my everyday life but I'm happy with the results! Do you dress down your outfits with trainers? Although most days I let my nerd-flag fly pretty high, playing the part of a cool person can be a refreshing change - and totally practical in the winter! 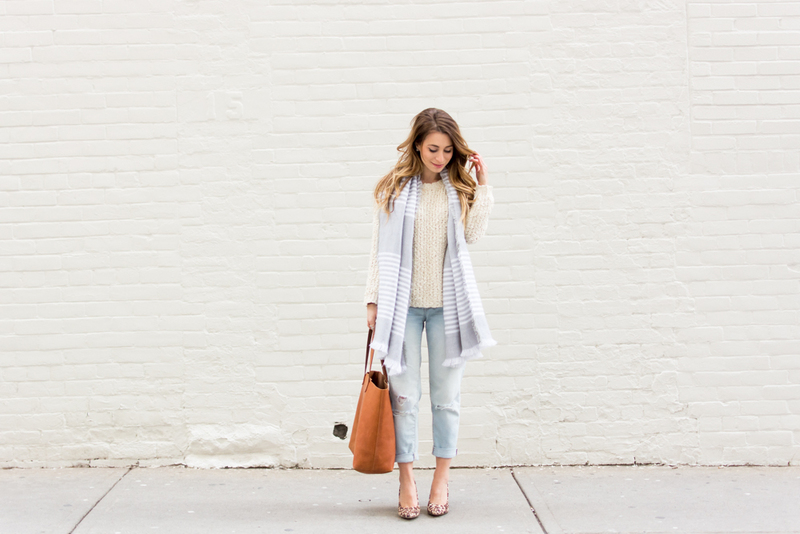 What do you think about the minimal, layered style to keep warm? 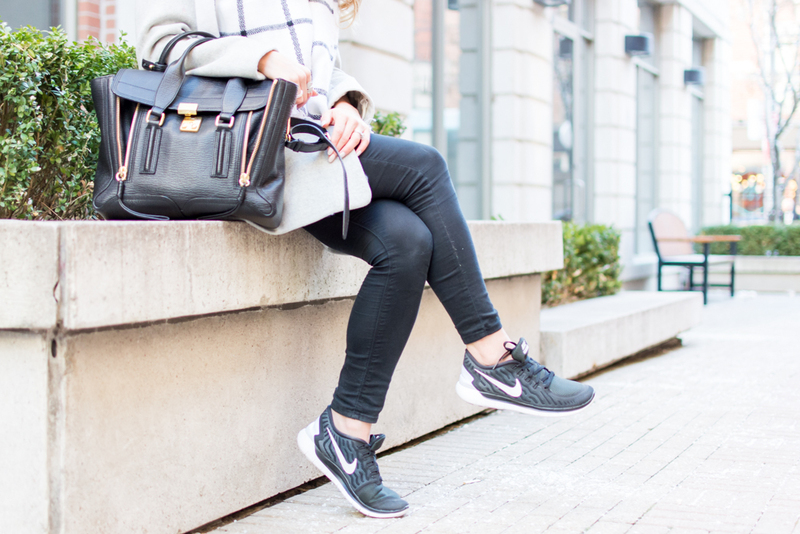 Do you wear trainers on the weekends to dress down outfits? Let me know! OOTD - Et Tu, Beret? I love decorative head-wear. 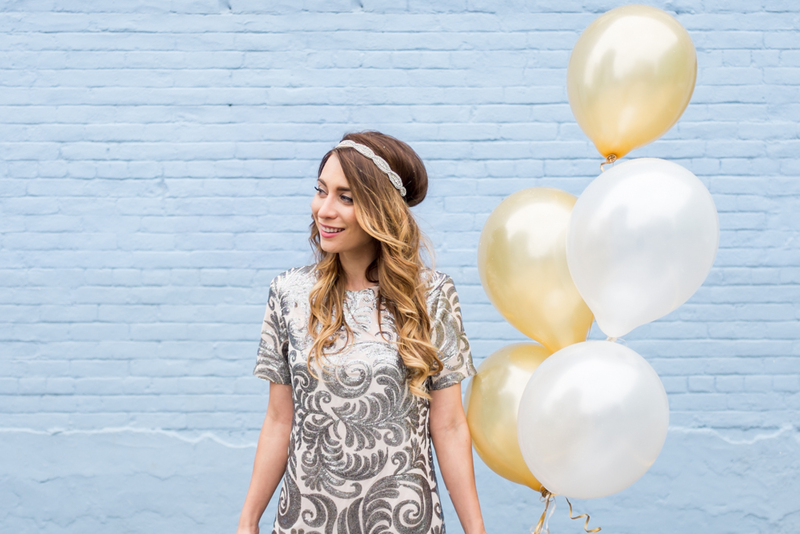 Be it a wide-brimmed hat, sparkly headband of a silk scarf - this gal is most comfortable with something fancying up her noggin. Naturally the beret should fall into the category of hat love but it's just one chapeau that I can't seem to work into my everyday routine, probably because it makes me feel like mime. Well, if you can't beat 'em, join 'em - by dressing like your stereotypical Parisian, that is. Although those of us who have visited the city of love know that this look would never be found on the streets of Paris, there's something so whimsical about dressing in character. Stripes were the perfect compliment to this raspberry beret (cue the Prince), and my favourite gold skirt finishes off the outfit nicely. I'm still absolutely loving this camel coat from Sumissura, last seen in this post. Although it's a little light for winter and would best suit the upcoming spring weather, I keep on finding excuses to pull it out. As a petite woman who struggles with sizing, when you have a coat where the sleeves fit - you find a way to wear it! 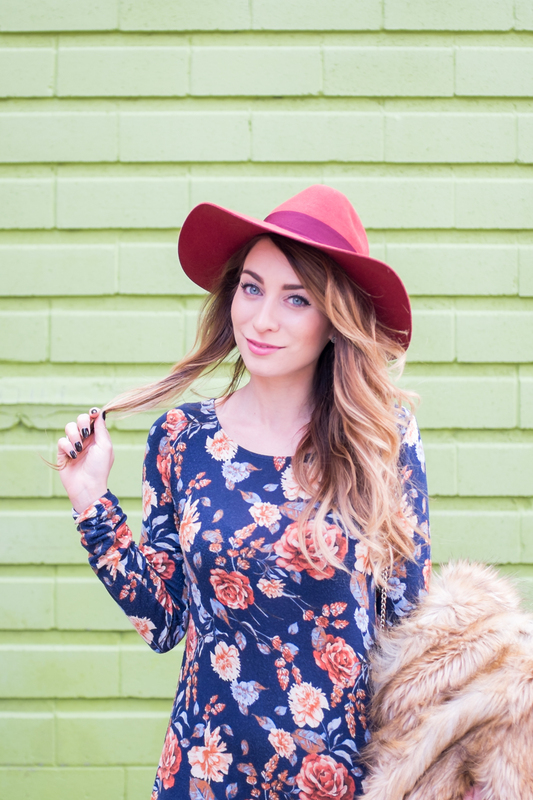 All in all, although the beret may not be a part of my regular hat rotation, it is a great piece to inject some fun into your outfit. What do you think, are you feeling the beret? 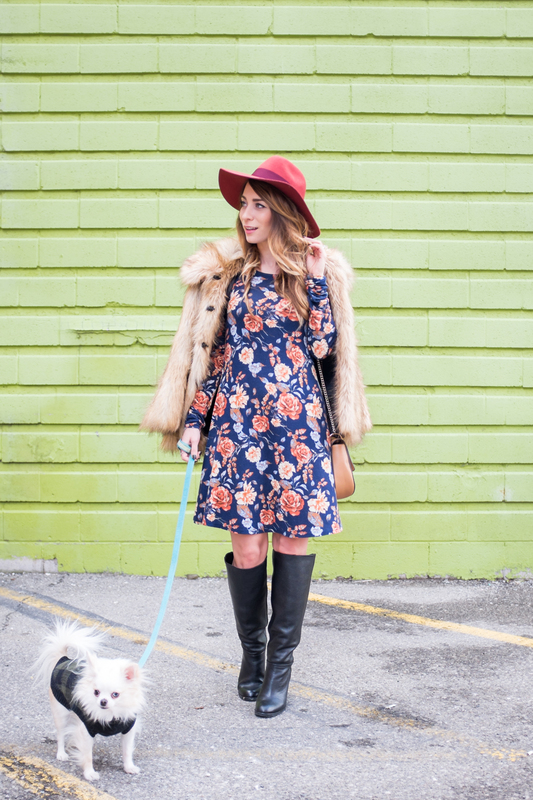 Do you have a certain piece that you struggle incorporating into your wardrobe? Let me know! As much as I enjoy my faux furs and costume dress, sometimes you just crave casual - especially on the weekends. 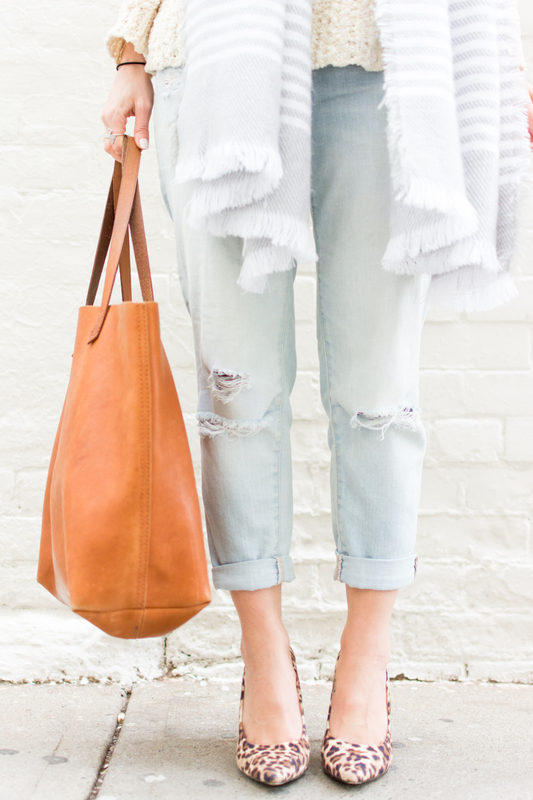 I'm having a newfound love affair with boyfriend jeans, and love their versatility and how uniquely feminine they become when paired with some heels. Thankfully Saturday was mild enough that a thick knit sweater (with some layers underneath) and a cozy scarf could substitute a jacket. 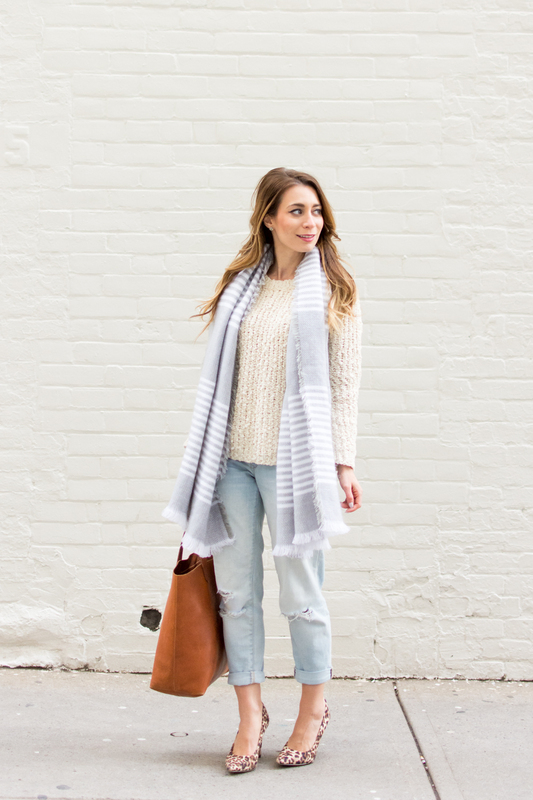 I tend to get lazy with my wardrobe in the winter, so boyfriend jeans are a great alternative to black leggings and boots - plus it gives a breath of fresh air with a lighter colour palette. Blogger Tip: I was in a bit of a funk on Saturday and just wasn't feeling how my face was turning out in the photos - we've all been there! Turning slightly away from the camera is how this sometimes camera-shy gal can handle having photos taken so often. Give this a try if you're struggling to get into outfit photos, or let me know if this happens to you as well! 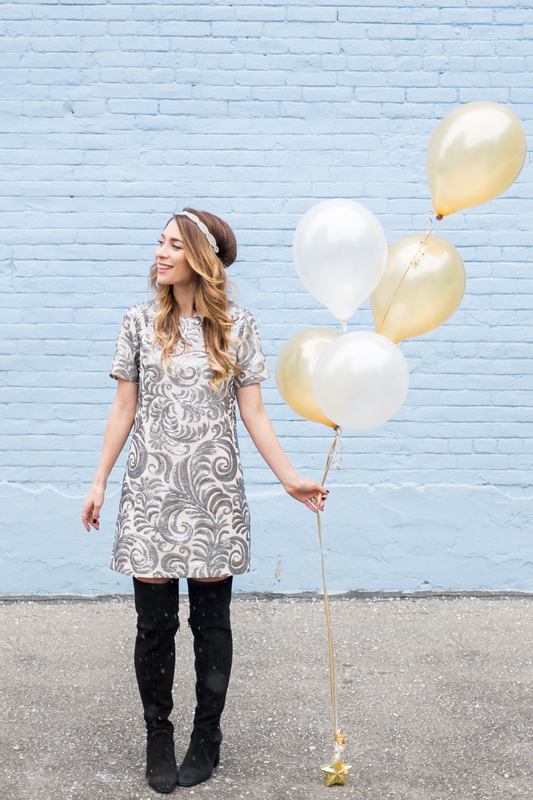 As much fun as it is to dress up, sometimes going casual is just what the doctor ordered. 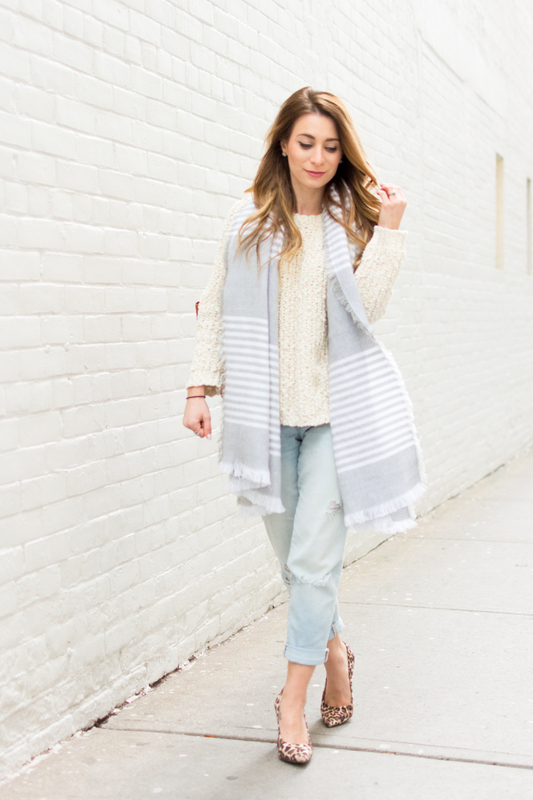 Are you in favour of the boyfriend jean and heels in the cold weather? 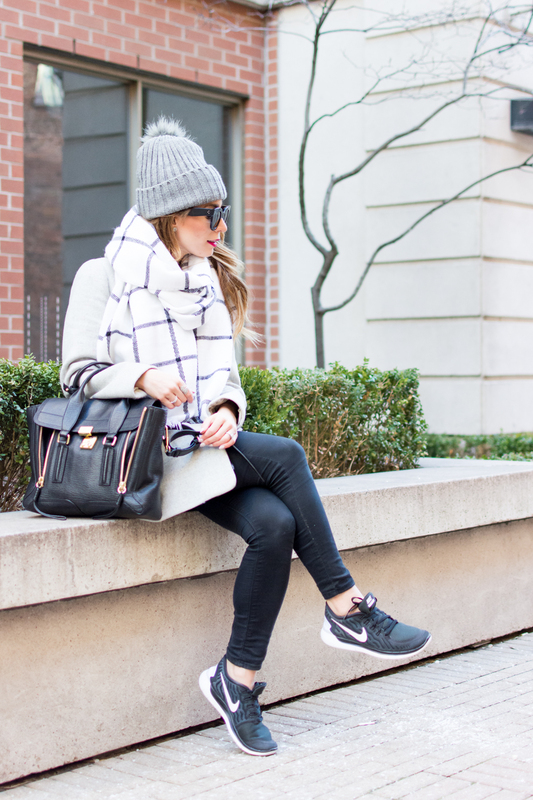 How do you break out of your leggings routine in the winter? Let me know! One of my favourite Ben Harper songs is titled 'She's Only Happy In The Sun' and it's a statement that rings true for my life, and my mood. I definitely find the winter months to be a huge struggle, not so much for the cold but for the lack of sunlight. The weather in Toronto was particularly dark and gloomy this weekend, and just as I found my energy levels slipping to an all time low I looked no further than my closet to turn my mood around. 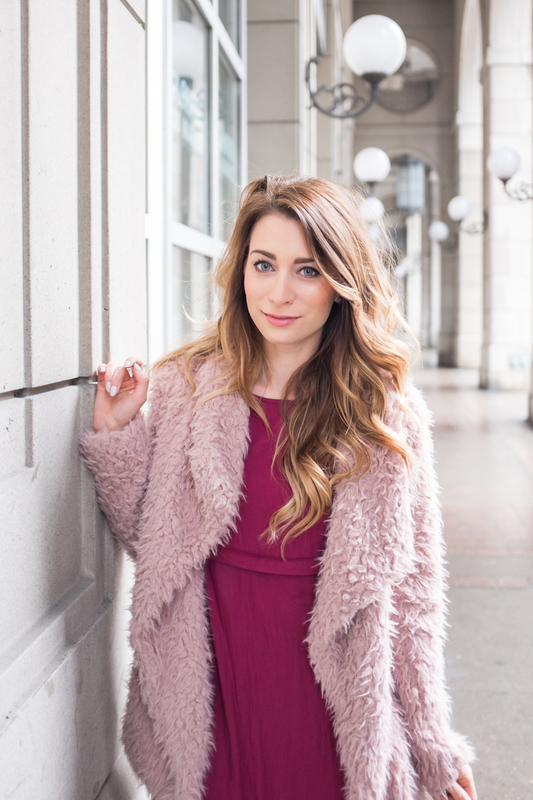 Enter a pink fuzzy jacket paired with burgundy mini dress; an unexpected colour pairing, but so fun on a gloomy day. I was having so much fun twirling in my bright wardrobe choices that I completely forgot how miserable it was outside! I may only be happy in the sun, but I've also learned that it's possible to create your own sunshine. This pink fuzzy coat is a great score from the bi-annual Zara sale. Although I need another jacket like I need a hole in the head, I honestly couldn't pass this one up - how fun is it? Plus this fun pink coat rang up to just over $20 so to me it was a no brainer. I'm fully expecting this piece to take me into the spring months, while also keeping me cozy for winter. What do you guys think of this colour pairing? Are you also affected by the sun cycles? How have you learned to cope? Let me know! 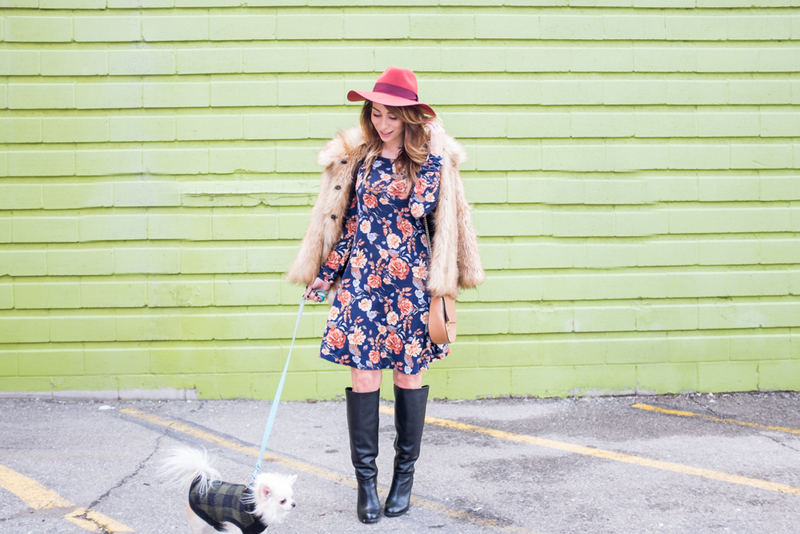 Before you have to ask, I'll answer a few questions off the bat: Yes, this is a seventies inspired faux-fur coat and rust coloured hat - and yes I wore both while walking Fritz around our neighbourhood. I feel as though I've learned so much since starting La Petite Noob, but one of the most important lessons is to really have fun with your clothes. Confession time: I used to be extremely self conscious about what I wore. I would sooner opt to wear a black sack that would have me dissolve into the background than something loud that would be noticed. Although this is something I'm still working on, as I get older I start to realize that nobody pays more attention to you than you do yourself. I take huge comfort in that fact, and find liberation knowing that most others are too busy worrying about themselves to care about what you're up to - or wearing. 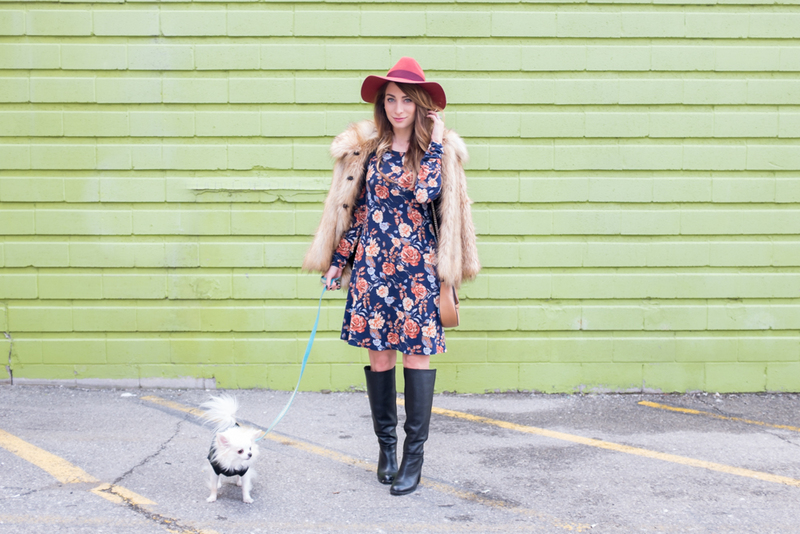 With that in mind, I proudly stomped around my hood in a navy floral dress, vintage faux fur coat and rust fedora; besides, nobody was really looking at me when I'm in the company of an adorable chihuahua dressed in an argyle sweater. What do you guys think? Do you struggle with being self conscious like I do? 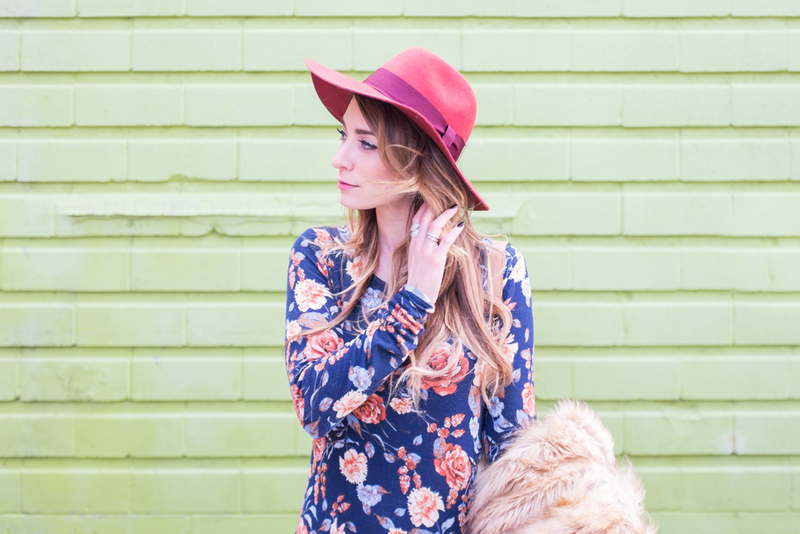 How about this seventies-inspired outfit - you likey? Let me know! Now that the champagne has been popped and 2016 already rung in, it seems strange to do a new years post now - but I couldn't let such a huge milestone go by without addressing it properly. I've always loved the refreshing sense of rejuvenation and self-reflection that comes along with a new year. Although my resolutions are fairly constant each year (one day I will eat healthier and get back to the gym) this year is especially exciting for me. I've made the conscious decision to really focus on the blog, and devote more of my time to it. The fact of the matter is that I get such joy out of La Petite Noob, and I feel like life is too short to not pursue your passion. That being said, I do want to thank all of you for helping me make this dream a reality - I absolutely cannot wait to see what path this journey allows me to walk down. So stay tuned for some big things coming to LPN this year, and please always feel welcome to let me know what you would like to see for future posts. You guys are the absolute best, and I can't wait to take 2016 by storm together! How was your new years eve? I had an absolute blast ringing in the new year with my parents, one of my brothers, uncles and cousins - with Brian and Fritz in tow, of course. We ate like kings, drank ourselves silly with champagne and just enjoyed the feeling that comes along with family being together. Although some may find staying in with family to be boring for new years, I come from a 'been there, done that' perspective about going out to big parties - this lady has spent one too many new years eve waiting over an hour in line for coat check at the end of the night! Just because we chose to stay in, doesn't mean that we skipped getting dressed for the occasion. 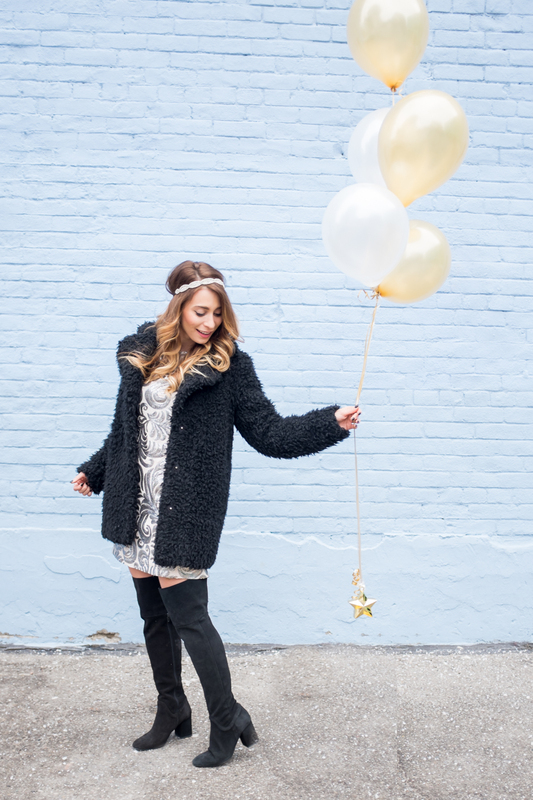 I've been waiting for an excuse to wear this sparkly shift dress, and what better than new years eve? Paired with some over the knee boots and a fuzzy jacket to keep warm, I felt totally festive while staying comfortable for the evening. 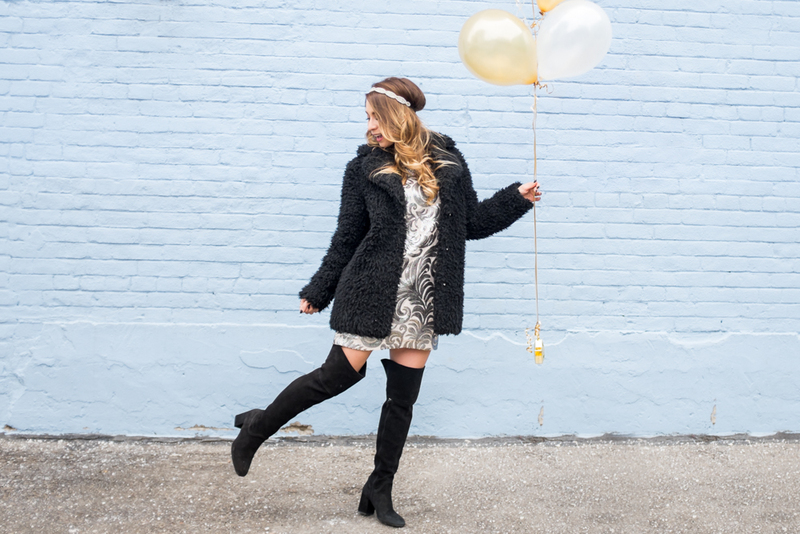 I hope that you're 2016 is off to a fabulous start! Let me know what you got up to this new years eve - did you stay in like me, or did you paint the town red? Let me know!